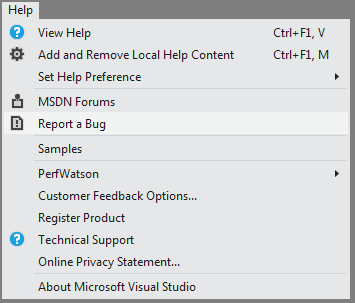 This tool is designed to simplify the process of providing feedback and reporting issues to Microsoft that you may encounter while using MicrosoftVisual Studio 2012. This tool does not currently support any previous releases of Visual Studio, and will only install into Visual Studio 2012. This tool will help you gather the information necessary for us to act on your feedback by helping to identify steps to reproduce the issue, attaching images of the issue from your screen, and automatically filing a report for you directly on the Microsoft Connect web site. All materials are available for you to review before you submit your feedback. Install the tool by clicking theDownload button above. More information on how to use the tool to provide feedback is publishedhere. Thank you for connecting with us! We appreciate your time and willingness to send us feedback about Visual Studio 2012!